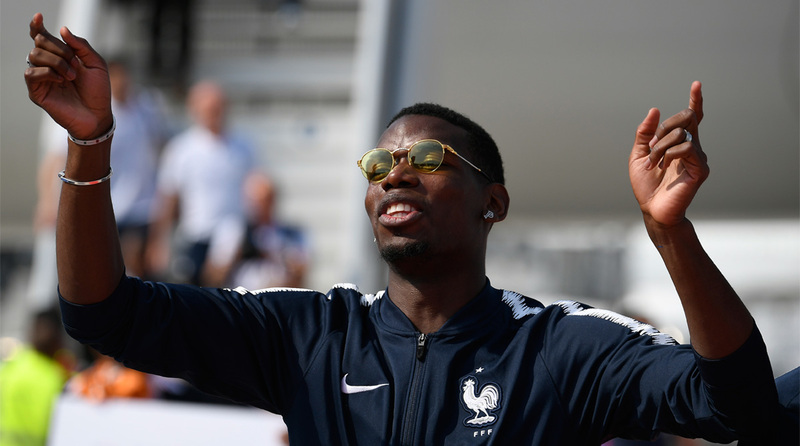 France World Cup star Paul Pogba is determined to end his fractious relationship with Manchester United manager Jose Mourinho and move to Barcelona. France World Cup star Paul Pogba is determined to end his fractious relationship with Manchester United manager Jose Mourinho and move to Barcelona, according to British media reports on Wednesday. The 25-year-old — who scored in the 4-2 World Cup final win over Croatia — has agreed on terms with Barcelona for a deal worth? 89.5 million ( 115 million, 100 million euros) over five years, according to the Daily Mail. The reported agreement would see him pick up? 346,000 a week, almost double what he earns at United. The Sun claims the former Juventus star — who joined United for a then world-record fee of ? 89 million in 2016 — has demanded the Premier League side increase his wages from? 180,000 to ? 380,000 a week so he is paid almost on a par with Chilean star Alexis Sanchez, otherwise, he will leave. United, though, would be most reluctant to sell him, with the Daily Mail reporting they have already rejected a bid by Barcelona of ? 44.5 million plus Colombian central defender Yerry Mina and Portuguese midfielder Andre Gomes. Mourinho has expressed his frustration over the club’s transfer policy, and Pogba’s departure would leave little time for executive chairman Ed Woodward to find a suitable replacement with the Premier League transfer window due to close on Thursday. The club has had to deny the claim that Pogba sent a text message to Woodward demanding he be allowed to leave. The Frenchman is keen to move to Barcelona — the Spanish transfer window does not shut till the end of the month — to play with Argentina superstar Lionel Messi, while his close friend and former Juventus team-mate Arturo Vidal also recently moved to the Catalan giants. Essentially, though, Pogba’s unhappiness stems from the deterioration in his relationship with Mourinho, who not only does he blame for his muted performances for United since his move but also for his qualified praise of his performances for France at the World Cup. “Paul was like the (France) team. He started average and ended top,” Mourinho told beIN Sports on United’s unhappy tour of the United States last week. Pogba, though, is believed to have been more upset by what followed in the interview as Mourinho implied being in an enclosed environment over six weeks ensured he focused just on football and not on outside matters such as commercial contracts. Pogba’s super agent Mino Raiola — who was also instrumental in bringing Romelu Lukaku to United last summer — has remained out of the fray, refusing to comment on links with Barcelona. “I will never make declarations about Paul,” said the Dutch-Italian agent, who is reported to have earned just over ?40 million when Pogba moved to United. “You have to speak to Manchester United,” added Raiola. Former United star Rio Ferdinand told Wednesday’s edition of the Daily Mail that Mourinho needed to fit the team around Pogba’s sublime talent, but accepted the player needed to adapt too. “It’s down to the manager to get the best out of him, setting the team up and setting Pogba up in the right way to achieve the best,” said the former England central defender. “But Pogba needs to play his part in that.